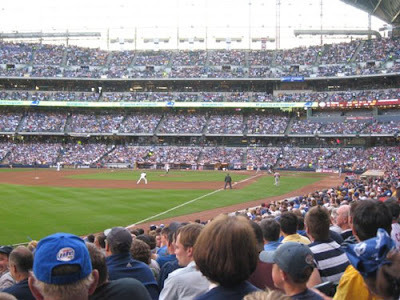 Took the kids to their first Brewers game last weekend. What fun. We even tailgated! Find more of this week's Wordless Wednesday posts at 5 Minutes for Mom and MomDot. Fun! Ball games are awesome. I've never been to a pro baseball game. I bet it was exciting and the kiddos had a blast!! Go Brewers! So, who won the sausage race? G-man will go to his first Brewer's game in August. Mhy 90 year old great aunt is coming and she wants to tailgate! Should be interesting! Brewer games are a lot of fun. I remember the last one we went to with our oldest about four years ago. I love tailgating too! So did they win? Looks like fun! Have a great Wednesday. How exciting! Glad you had a good time! That sounds like fun! Alex is at the age where he's too active for a ball game so it will be a year or 2 before we take him back there. I'm jealous of the tailgating part!! You should link up at http://angiescircus.blogspot.com I love her wordFULL Wednesday! i love baseball season!! cant wait to take my little man to a game!!! It looks like everyone had a great time! Baseball season is lots of fun. love a good baseball game! happy ww, thanks for coming over to my blog. I have always wanted to go to game with my kids, but I haven't made it yet. Soon!